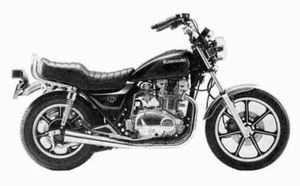 The Kawasaki KZ750K is a motorcycle produced by Kawasaki in 1983. American sports model with belt drive. 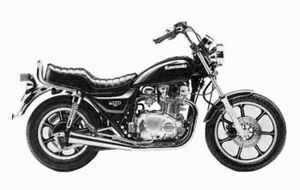 Front dual disc and rear drum brakes, cast wheels, air adjustable front fork, spring tension and damping force adjustable rear shock absorbers. Electric and kick starter, and transistorized ignition system. Changes: Color and graphic, new side stand warning system, anti-theft cable lock plug. This page was last edited on 26 August 2010, at 18:23.